The next Evolution of Tanks special is a special one indeed: the British Centurion Action X! This Tier X vehicle is a recent addition to the World of Tanks stable and has been a fairly common sight in the battlefields. A direct continuation of the Centurion 7/1, the Action X is capable of shifting flanks relatively quickly and deploy in favourable positions to snipe the enemy. If you're the sort of player that prefers keeping their options open and assisting the team in multiple roles, the Action X is for you. Click here to view the complete technical specifications for the Centurion Action X. 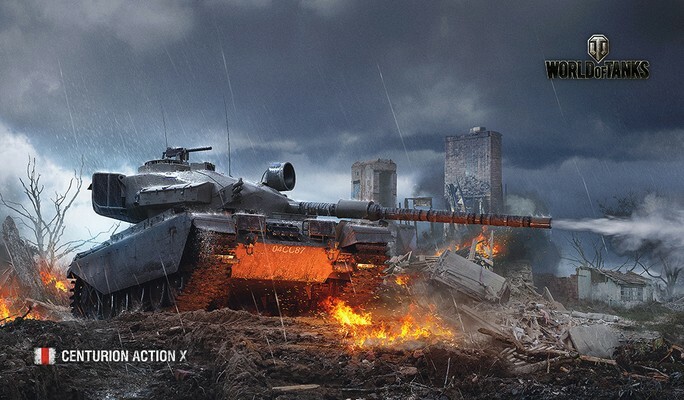 This edition of the Evolution of Tanks special grants a 30% discount for the Centurion Action X, and up to 50% discounts for other vehicles in the same tech tree branch for a limited time only.Several new missions will also be introduced that will also reward you with various consumables and several equipment, suitable for augmenting your new Centurion Action X. While the Centurion Action X is an excellent tank to own and battle with, there is yet another reason to grab it when this special begins. On 5th February, the Centurion Action X Marathon will begin. The missions contained in the Marathon requires extensive use of the Centurion Action X... but if you complete them all, you'll get its predecessor - the FV4202 - as the ultimate reward. Time to get your Action X ready for the Marathon. Roll out! Complete 'Mission: On Track to the Centurion Action X' 4 times. Complete 'Mission: On Track to the Centurion Action X' 8 times.